League leaders Linfield travel to face Newry City in the Danske Bank Premiership on Tuesday night and manager David Healy knows what to expect. 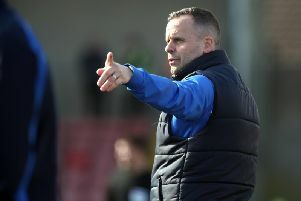 The Blues are flying high after a 1-0 win against Crusaders at the weekend but former Northern Ireland striker Healy knows 11th placed Newry will not be an easy touch. “It’s a tough game and I was down watching them against Crusaders last week and they are fighting for their lives. I expect a tight game and they are never easy to play against. And Healy says no-one at Windsor Park is getting carried away and the fight for the league title is well and truly on. “There is a long way to go and Ballymena United are still there and Crusaders will come back fighting. “We are looking forward to the challenge and we relish the challenge. It’s us against the rest and that is what I tell the players. “Who knows where it will take us this year. We are in a decent position and we are there or there about. “And I hope these players go on and show how good they are. Not to me, not to the staff but to the people watching that they are good players and we are a good side,” added Healy. And Glentoran have signed former Sligo Rovers captain Gavin Peers. The defender, who won the Premier Division league title and a Setanta Cup with Sligo, spent last season at Derry City. Peers was at Blackburn Rovers and Mansfield before returning to Ireland to join Sligo, where he won six trophies in 11 years. “I’m delighted to get such an experienced player in,” Glens boss Gary Smyth told the club website. “Gavin’s career has been laced with success, no matter what club he was with. “Obviously his most successful time was at Sligo,” he added.